Hummingbirds are often referred to as Nature's Jewels and this featured product lets you "collect" them from the safety of your own home. The feeder easily mounts to any window with two durable suction cups, which allows you to get close to the hummingbirds without scaring them away. 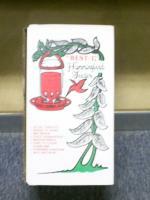 With a bright red cover on top of the feeder, hummingbirds will be attracted to the Jewel Box and come in for a drink. When they land, Aspect's trademarked HighView perch allows them to comfortably rest while feeding. Because ants are also attracted to hummingbird nectar, the Jewel Box conveniently comes with a detachable ant moat that you can fill with water. The curious ants won't be able to cross the moat, leaving your hummingbirds safe and undisturbed. The hinged lid on the feeder allows for easy refilling of the 8-ounce feeder and features three ports, so your hummers don't have to fight over the nectar. 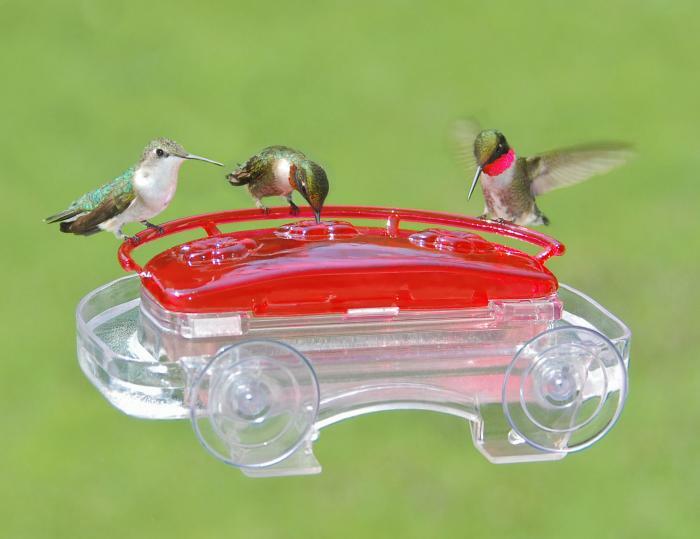 With a sturdy design made from polycarbonate material, the Jewel Box is the best way to enjoy hummingbirds from your window. I am an amputee and spend most of my days in the house especially here in Vegas during the summer months. We put the feeder in the living room so we can watch the birds. All in all we have 4 feeders and because it's in the shade it gets the most hummingbirds. My wife even has names for all of them and now have around 10 regulars which even the neighbors get to enjoy them along with us. This new one gives the littlest birds a leading place so they don't have to use as much energy to feed. I. could write pages of enjoyment so I rate this feeder a 9-10 Everyone should get one if they enjoyment as we do. 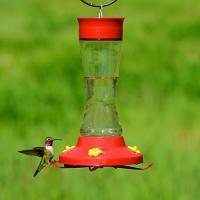 This little feeder is exactly what I wanted and perfect for my window, better yet my two little Hummers Like it too. It's very pretty in my window and it is very easy to take care of. I was delighted to see my first hummingbird. I'm giving this 4 stars because, on the surface of things, the design looks great. It's just that we've had no customers! 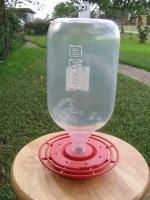 Late this season we took down our successful drip feeder because wasps were muscling out our hummers. I bought this as an alternative. As I said though, no one has come to it. I plan to hang it next year (we are seasonal in Vermont) and I've no doubt it will be a hit! 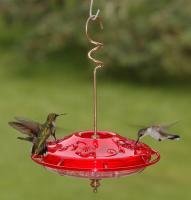 The feeder is great with the moat that allows no insects into the hummers nectar! 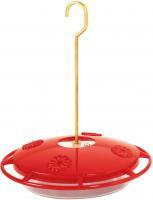 The feed rest solidly on the window and allows for a great view of the birds feeding. It did take almost two weeks before the birds realized that it was a feeder. They had been used to a vertical window bottle that they sat beside.